The early onset of autumn this year, a month or so earlier than usual, is a reminder that we are moving ever closer to progressively colder temperatures, reduced grass growth and quality as well as significant changes in the daily management routine due to shorter daylight hours and the switch to using conserved forage (hay/haylage) as a major component of the equine diet. 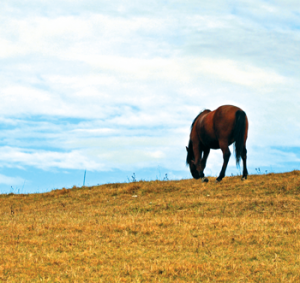 Alongside these changes many equines are likely to spend more time each day in indoor stabling at night, or even all the time to avoid paddocks suffering damage by trampling in wet weather. Such changes can cause stress initially and some stress factors may persist over the longer term – so how do we care for the golden-oldie as the seasons change? Ann Townsend explains more.